I am taking a little turn in the road this time. Before Greg left AnnTheGran, he requested that I write a blog about Ralph and his woodworking skills. After attending the ATG Community Circle, and meeting Pat Snyder, she also requested the subject. My daughter, has asked me also to write about her Dad and all the great things he has done for us. May I begin by saying that I am his greatest fan, aside from his two daughters and one very inquisitive grand son and a grand daughter or five girls who think that their Grandpa can fix and do anything. Two of them always want to see and help Grandpa when they visit. The youngest granddaughter who is now six years old, was also “all eyes, ears and questions” when she was helping Grandpa Jones. By the way, besides woodworking, they know that he can drive a tractor and a motor home, cradle children lovingly in his arms and also make jokes with them anytime the chance arises. His love of woodworking stems, I believe from his being a machinist mate in the Navy. A machinist mate is rather like a mechanic for cars. In his vast experience, he came from the bottom up, learning the very depths of the operation of a ship’s engines. Over the years, he learned and grew until after many years in the Navy, he became a leader of his shipmates. Somewhere along the way he acquired a wife and two fine daughters, whom he was never allowed to take with him in his “seabag.” His acquisition of tools became a very big part of Christmas, Father’s Day and birthday in the Jones home. He’s not a collector of anything but family and tools, mostly of the woodworking type. Long ago, I bought his first miter saw and as time went on, I gave him a great many of the tools he now owns. To my great joy, those tools have assisted him in his craft. In the 1970's, we found a pattern in a magazine for a wonderful sewing cabinet. At the time, he had a very limited supply of tools, but this cabinet has become one of my most prized possessions. The first photo shows a closed view. Behind the doors there is storage for fifty-six spools of thread and seven drawers. There are two leaves on the top that fold out to accommodate a cutting board that is stored in a small shelf on the back of the cabinet. 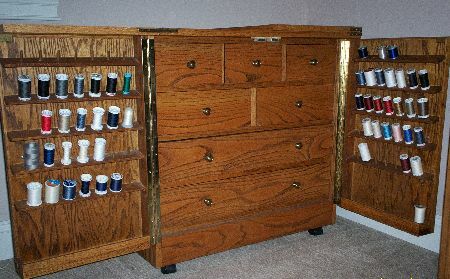 For many years, this cabinet was the main storage area for my sewing equipment. Now that I have my sewing closet, I use the cabinet for notions and other little things. 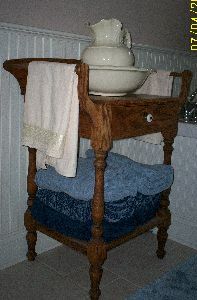 This next photo is a reproduction of an antique wash stand. He made it because I always wanted an antique one, but they were too pricey. It makes a great place to store towels. The bowl and pitcher are ceramic, also reproduction. It’s fun to have things that look like antiques, but the low price variety. I have several of those. He has made several quilt racks and hangers. 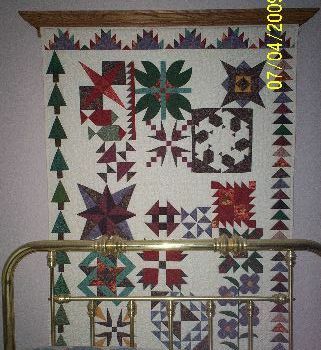 This quilt hanger above the brass bed was made for the quilt that it holds. The Quilt is called The Alaska Sampler. Each block represents something in Alaska. 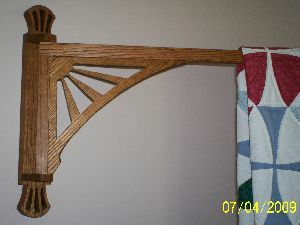 He has also made a simple quilt rack that has rods for six quilts. However, they don’t display well on all of the rods, so I have only four on it. This one is not pictured here. Now, to the really neat thing that he made for me several years ago. 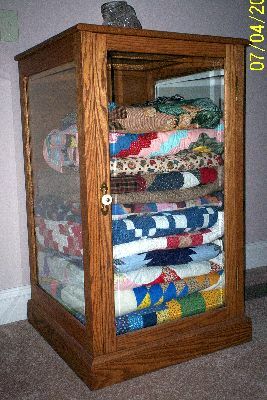 I was in a quilt shop one day and I saw a quilt chest that I kinda liked, but it gave me another idea. 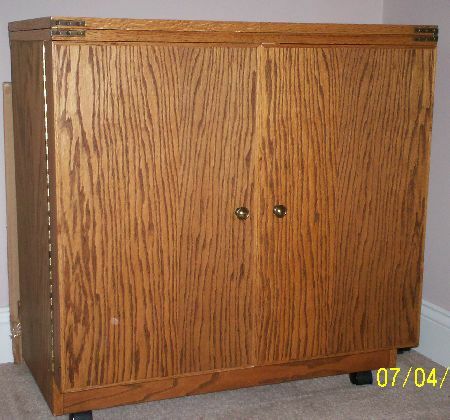 The chest I saw was made similar to a cedar chest, or blanket chest. It was short and wide and it had glass sides. I thought my idea was better because I could stack more quilts in it and it was bigger, but it takes up less space. I described my idea to him. The next year, I described it to him again. He didn’t get it the first time, or the second time. Actually, it took several times to get the idea across. But once he started on it, I could tell he really understood what I told him. It is a vertical chest, about two feet square and four feet high. It is made of Oak, and it has beveled glass sides and the door is also glass. The door opens in the front. I have included photos here. If I make many more quilts, I’ll need another one, it’s getting full. The second photo here shows the way Ralph signs his work. He has an electric wood burning tool that has his name. Next to his name, he embeds a shiney new Penny to show the year that the object was made. Not an original idea, he read about it in a magazine. 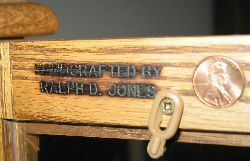 The wood-burned signature reads: Handcrafted by Ralph D. Jones. The penny carries the date the quilt chest was made. I have not written about these projects in the order they happened. I will however, go on to some of the earlier things he built for our daughters. The first two things were for our daughters when they were expecting our first two grand daughters. 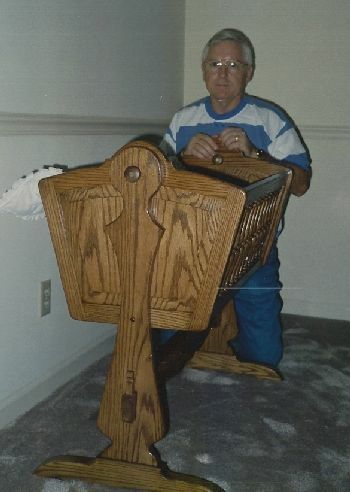 In one of these two photos, Ralph is with the first of two cradles he made. Our first grand daughter was born in 1990, the second, in 1993. Sometime after the year 2000, our oldest grand daughter began to play the oboe in school. Her younger sister and brother followed her example and began playing the oboe, as well. 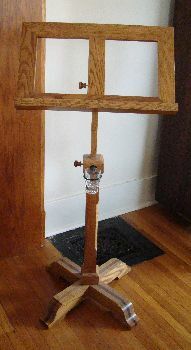 Because of this, he made this music stand that has inlaid walnut wood in the center of the legs. It features a small glass just below the easel part of the stand. This little glass does not appear on all music stands. It is used to hold water. The oboe players use it to keep their reeds from drying out. They will all surely be heirlooms. These three photos are shown below. There is not time or space to show all the things he has made. He made a clock for each of our daughters after they had homes of their own. He has made wooden banks for each of the grand children, except Savannah, the youngest. He owes her a bank. Each bank has an antique metal mailbox door on the front. He made a toy riding airplane for our grandson when he was very young. There have been more projects. I have just shown the best. I can only say that all of these things are special to each of us. We do so appreciate the time and love and skill that has gone into them. As time has gone on, his tool collection has increased along with his skills. With each project , he learns something new. Does he sell his work. An emphatic NO. He is so meticulous that it takes many hours to complete any project. Like my quilts, it takes too much time to put a value on the skill and workmanship involved. Besides, it would lessen the enjoyment if he was on a time table. Now, one last photo. I need to thank my daughter, Barbara for helping me out, with very short notice, I asked her to make photos of the special things that her Dad has made for her and the kids. I did not know about this photo until today. 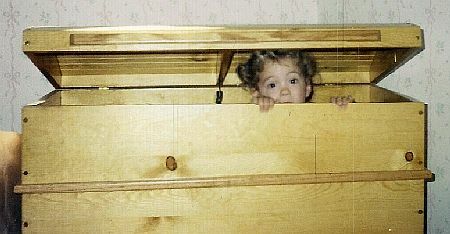 When I opened the email that held this photo, I saw two bright little eyes peering out at me. It made me cry. In this photo, Kasey looks just the way she did when she helped me quilt MaMaw Wosie’s Banket. Kasey is now 18 years old, and will be going off to college this fall. 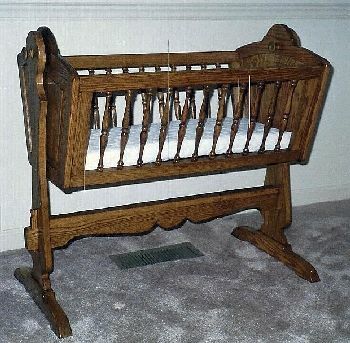 MaMaw Wosie’s Banket and it’s story are featured in an earlier LaRueSews blog. I am quite easily brought to tears. I have a tender heart, especially when it comes to family, and making people happy. I hope you have enjoyed this blog as much as I have enjoyed writing. I’d also like to thank the several people who encouraged me to write about this very special guy who loves us enough to make his time so very worthwhile. What a loving blog! I too got a little tearry eyed over the wonderful peeker from the chest! I thought Ralph was not only a gem, but he put up with all the ladies around him and kept smiling! I am a fellow quilter and have enjoyed all your informative posts. I often send friends who are learning to quilt to your blog. You have done a great job providing a comprehensive overview of our hobby. Do you happen to have any mystery quilt ideas you could share? Our Kentucky group is looking for an idea. Your husband has made such beautiful items. Do you think we might have on online mystery quilt???? Having met both you and Ralphat the Community Circle I fully understand you statment about the daughters and grand daughter thinking he can do anything. His work is beautiful and the story excdellent. So glad I had the opportunity to spend some time with both of you and hope we have the change to do it again. You are both great people. Woodworking is such an art in itself. You are so lucky to have him. His projects are just beautiful. I do so enjoy your blogs. Thank you for your most welcome comments. DH can enjoy himself, in spite of the circumstances, not to call the two of you "circumstances", but we really did enjoy ourselves. Just to clue in all of the others who are reading this, Linda, Pat, My husband and I had dinner together after the ATG Community Circle. I'm not a good person to ask about mystery quilts. I have done three of them, while attending quilting retreats. As for having one on line, I wouldn't have any idea how to organize it. However, I will put my thinking cap on and see if I can come up with something simple that any and all of you can do as a challenge from me to you. How's that sound. So glad to hear from you. I have spent the last two weeks recuperating, think I'm on the mend now. Between you, Pat and me, we really found some friends, didn't we. Thank you for hangin' in there with me. I've gotten so I recognize your dog. Thank you for your comments. Yes, I am a lucky girl. He has several more projects in mind for me/us. But it really does take time. Glad to have everyone staying up to date on LaRueSews. It's fun to read about all of you. Did you just find LaRueSews-Quilts, or have you been reading it for a while. If you just came upon it, bo gack and read the others. They have appeared about every other week since last July. I haven't written about ATG Community Circle because I thought enough people have written about it that I didn't need to overlap anyone's info. We had a great time. We learned about sweatshirts, aprons, zippers, fitting clothes, emb. machine applique. The machine applique was called EasyStitch Applique, by Dalco Home Sew. It was pretty neat. You can see it a dalcohomesew.com. We saw a lady talk about makng purses and tote bags from five yard long zippers. That was neat, you can see them at www.myzippers.com and marymulari.com. I liked them because I thought my grand daughters would like them in school colors. The food was good, the friendships were wonderful and everyone there was simply terriffic. Besides that, I'll tell you more tomorrow when I see you at quilt guild. You think you are too smart for you're own good. I recognize you email address. I almost asked where you live in Alabama because I almost missed your name at the end. Come and SEE my stuff!